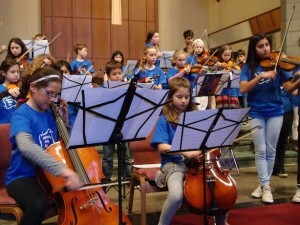 At Larchmont Music Academy, we believe in bringing music to the community. Both students and faculty perform regularly in concerts throughout the area. These recitals offer students the opportunity to perform in a formal, yet non-threatening setting for their family and friends. They are held at the end of each semester at the New Rochelle Library Ossie Davis Auditorium and at the Academy. Each venue offers a unique atmosphere that supports the student's growth and development. These classes are a great opportunity for small groups of students to practice performing in a friendly non-threatening environment. Special classes are scheduled to prepare students for all-county NYSSMA auditions and student recitals. Strategies for combating performance anxiety are discussed, as well as a variety of musical topics. They are held twice a month and led by members of our faculty. Both students and faculty are encouraged to participate in concerts given in the community throughout the year. The Academy brings music to local nursing homes, hospitals and libraries. Performances include yearly participation at fundraisers and charity events such as Sheldrake Environmental Center's Fall Festival, Oktoberfest to benefit Breast Cancer Research, Sarah Neuman Nursing Home, Ronald McDonald House at Maria Fareri Children's Hospital at Westchester Medical Center, and many more. 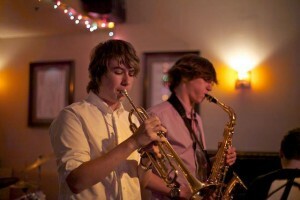 Student and Faculty ensembles perform at local restaurants regularly. Several times per semester the student jazz ensembles and rock bands perform in the classic setting of Vintage 1891. Enjoy a meal or a glass of wine while listening to world class music right here in Larchmont. Our extremely talented faculty perform both solo and chamber works each semester. These concerts range from classical to jazz styles and are a wonderful way for students to be inspired and to hear great masterpieces performed by their teachers. Our faculty members perform throughout the world, we bring the world to your doorstep. Concerts are held at the Hampshire Country Club, at the Academy and in local house concerts throughout the year. 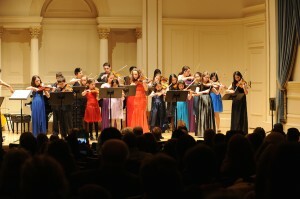 Every year, the Larchmont Music Academy presents special concerts in Carnegie Hall. Selected honor student soloists and ensembles are invited to perform in these life-changing concerts. 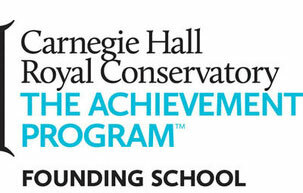 We answer the age old question "How do you get to Carnegie Hall? "...take lessons at Larchmont Music Academy.